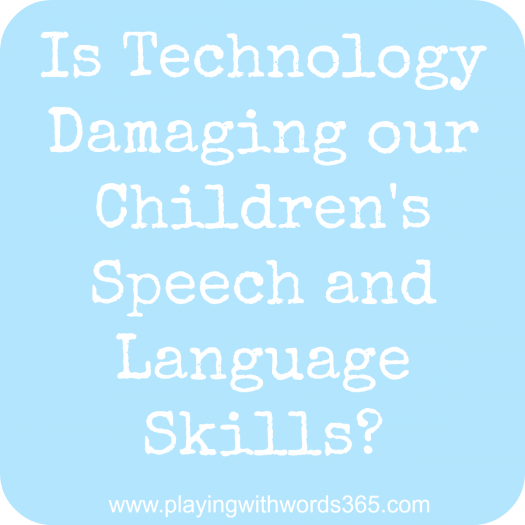 Is Technology Damaging our Children’s Speech & Language Skills? Recently a fellow SLP shared an article from the UK entitled Gadgets blamed for 70 per cent leap in child speech problems in just six years. It got a small dialogue started when I shared it on my Facebook page, with most commenters agreeing with the article. Let me begin by being honest with you all: We own an iPad. And two iPhones, a MacBook Pro, a couple flat screens, a Blue ray player, and many DVDs. I am the first to admit that I spend too much time on the computer (but then again, at this time I am also using the computer to work so it is part of the job) and I love playing on Facebook on my phone. I actually fought the smart phone craze for a while…but I also saw the may benefits of having one. I fought it because I got sick of seeing people constantly checking their email and such while around other people. And I told myself I wouldn’t do that. But admittedly, I do sometimes. Being transparent with you all and honest…I do think (and always have) that technology can definitely hinder speech and language development. And here is why. The time spent (for a child) on the iPad is…. …time not being spent having a back-and-forth conversation with his mother, father, or siblings. …time not spent building towers with blocks and practicing motor and visual processing. 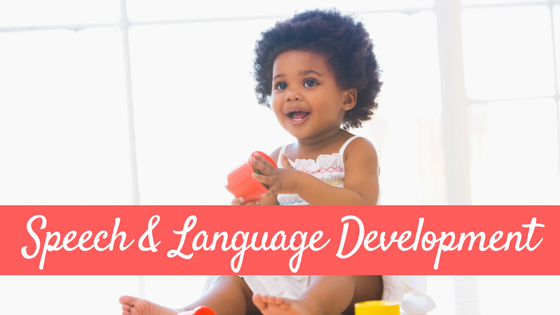 All of which are VERY important activities for the development of speech, language, social, and cognitive skills. But this isn’t just about iPads. The time a child watches a video on the way to the grocery store could have been used to play I Spy, 20 questions, or just used to have a discussion about current or upcoming events. 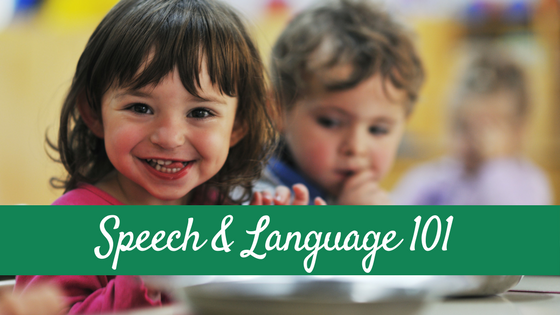 All of which are fantastic speech, language, communication, problem solving, and critical thinking practice. The time spent playing video games could have been used to play an interactive board game with family….an activity that promotes family bonding, relationships, as well as speech, language, and cognitive skills. If a child watched TV all day long, he is missing opportunities to play with toys and play outside. Basically…the time spent on the gadgets could be better used for play and human interaction. But wait….is it REALLY the technology? Ok ok…let’s be honest here. It isn’t the technology, per say, that is causing issues but really the lack of time we, as a society, is spending REALLY interacting with our children in meaningful ways. It is easy to blame the iPads, video games, and TV but in reality, it is the parents that control our children’s time with these gadgets. And it is the parents that are in control of their own time on the same devices. It is not the iPad people…it is our own parenting. It is our own time management skills…or lack there of. Notice I say our. I am not immune to this. My personal issue (other than my own computer use) is my kid’s TV time. I’ll do great at limiting it for a while…and then a kid gets sick so we end up watching extra and them BOOM. I have to fix it and it is hard. And that is totally possible! I never said the iPad or other gadgets will ruin your kid. In fact, some TV shows are very educational! My kids LEARN from TV! And I hear there are some great apps out there too! But that doesn’t mean I should let him play with it all day. And for children, some of the best interactions are play. PLAY. As in…get down on the floor and play with your kids. And read to them. yeah yeah…you can read them books on the iPad I suppose but READ. PLAY. SPEAK. INTERACT. LAUGH. MAKE EYE CONTACT. iPad’s are not the devil. A little TV will not damage your kid. Used in moderation, these gadgets and technology can be a great way to supplement education and can be a source of entertainment. Speech Pathologists use iPad’s in therapy for goodness sakes! There absolutely is a time and a place for technology. In no way do I think you should throw them all out and let me tell you the TV has saved me a few times from losing my mind. And then there are times that technology is totally inappropriate as well. For example, an app cannot replace speech therapy. There are some AMAZING apps that can be used in therapy and in home practice, but an app cannot teach a child a skill…it can only allow them to practice that skill. A real person must first teach the skill. Moderation is KEY: But How? I already explained that I don’t think technology is the devil…but let’s admit that moderation is pretty important. And moderation can be really hard. Not only for your kids, but for yourself. If it was easy….no one would struggle with over eating, drinking, and other things that can be addicting. When I found myself struggling with the amount of TV my kids watched a while back…I made us a visual TV Chart. You can see it (and download it for Free) HERE. They can watch 2-3 2o-25 minute shows a day max. That is just under/about an hour a day and since we only watch TV on demand, they are not exposed to commercials. Some days there is NO TV at all. And if we are sick? It could easily be much more. The chart helps us ALL know how much TV is being watched. 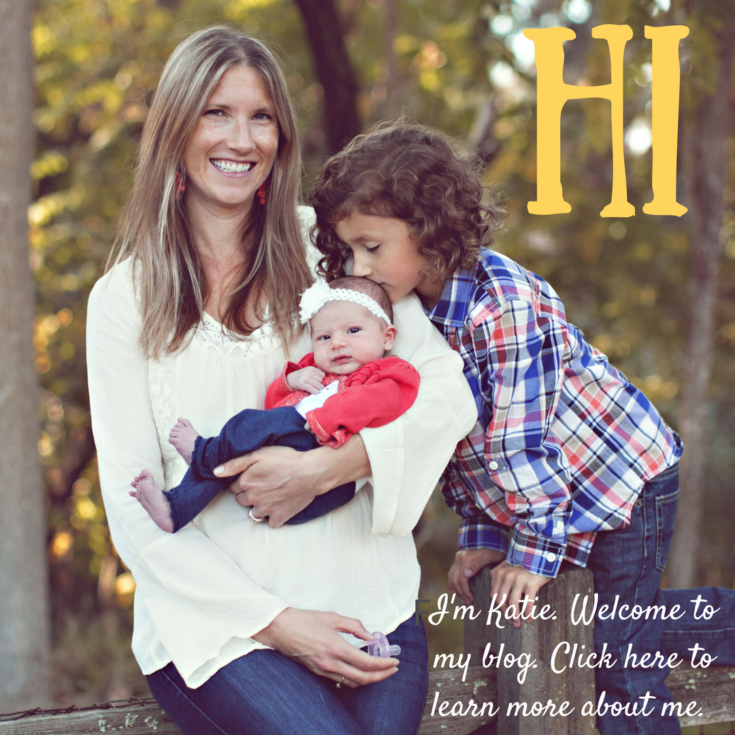 **Update February 2014: Now that my kids are 5 and 3, they both have a great concept of numbers/counting. They each are allowed to pick one 20-25 minute show a day on days we watch TV (some days we watch none). This has worked very well for us! Another thing we did, was when we were buying car two years ago, we made sure there were no DVD players in it. For me….I didn’t even want them in the car! No…I don’t think they are evil but I don’t see a point in having them on when you go for a 10 minute drive. And my family did a LOT of road trips as a kid and I never had one on the road…I read and played games, drew pictures and had actual conversations with my parents and I just wanted to not even be tempted with having them in my car. As far as the iPad…we only have a few kids apps so that helps keep the time limited. Also…out of sight out of mind can be helpful. I want to hear from YOU now. What are your thoughts? 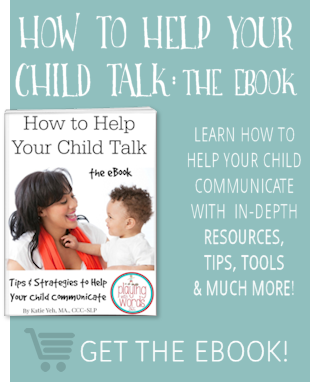 How to you think technology effects the speech, language, and social skills of our little ones? Do you find yourself struggling with the use of technology in your home and if so, what methods do you use to limit it? Looking for Help on How to Unplug? I highly recommend checking out (affiliate link->) Hands Free Mama: A Guide to Putting Down the Phone, Burning the To-Do List, and Letting Go of Perfection to Grasp What Really Matters! if you are interesting in learning more about unplugging and getting connected! As a librarian who will be beginning an iPad centered storytime next week I am excited how to demonstrate that technology can be used in an “active” rather than “passive” way. I agree with what you are saying, that technology might be getting the blame, but it is really a collective choice to use it instead of interacting with kids. Technology has made it easy to keep kids distracted while convincing yourself they are “learning” from the “educational” apps. No matter how great the app is, a child doesn’t learn without quality time exploring with someone they feel safe and comfortable with (enter Maslow’s Hierarchy of Needs). With the iStories (the name of my program), I’ll be demonstrating how to interact together with the digital story in an active way – rather than just sitting the child down with it (babysitter style) and doing the dishes. Hopefully the experience will show parents how they can use the iPad as a literacy tool rather than a babysitter. Lizz YES!!! Exactly! Like I said, technology can be a GREAT way to supplement education and to even learn things but when we just give the kid the iPad and walk away…we are actually doing a disservice to the child. I agree with you that technology can absolutely be used in an interactive way. I think one issue I come across as an SLP is “What apps can I use to help my child talk” and I have to explain that there are no apps for this. Talking involves a human. 🙂 Like I said, SLPs use iPads in therapy because there ARE great apps to help with teaching certain concepts and working on articulation…but it is being used interactively with a trained professional. Great comment and thats for joining the conversation! Ive worked with a lot of kids in schools and again now with my sons friends a homeschool groups. I can tell which kids watch Tv vs not. Their topics of conversation,vocabulary, attention span and observation skills directly reflect from screen time. The smartest kids I know watch the least amount of Tv. I’m a single parent and my son isn’t allowed Tv. . We do a very occasional movie or a 2min- homeschool related youtube clip. I calculated it the other day and it averages 1-2 hours a MONTH. 2-2.5 hours a day for Tv sounds like a lot to me. That’s 1/6 of awake time. For kids in school 2.5 hours is like 1/2 of their at home time.. Figuring they sleep 12 hours and are in school 7 hours including commute that leaves 5 hours. Tv is 2 hours that leaves 3. When you take out getting ready for school and bed and eating breakfast and dinner that leaves very little time for “play “. Add in some errands, homework etc and you have no time to play! I always thought it was supposed to be no more than an hour a day for all screen time including Tv computer ipad phone etc. I love listening to my son pretend play. He does get to watch t.v. or use the computer a couple of times a day, but hearing his words and how he uses them is priceless. I LOVE hearing this: “Hearing his words and how he uses them is priceless.” So very true. My son is just starting to combine words and I am loving hearing what he comes up with and the new words he used. Like I said, he watches some TV and his favorite show of all time is Mickey Mouse Club House…and he LOVES his Mickey mouse stuffed animal and today he has been playing with it all day 🙂 It makes my heart smile. My little one has great language skills which we have encouraged by reading to her since she born, talking with her and getting down on the floor and playing with her every day. We also do limit her screen time to one hour a day (and not every day), and try to make that time as interactive as possible by commenting on what is happening on the show and singing the songs together etc. We have recently purchased an IPad and I must say she has taken to it, her most recent favourite App has certainly expanded her vocabulary because she is coming out with fruit names I am sure we haven’t taught her haha, but again we play together most of the time and make it as interactive as possible. TV or the IPad can definately be a sanity saver or allow you a few minutes to do something without little people under foot but moderation and interaction are the rule in our house. Julie you made a great point about how TV and the iPad CAN be interactive, if used the right way. When it used this way it becomes an interactive teaching tool and not a babysitter. I think as long as you use technology in that way and remember to teach and interact in other ways as well..BALANCE…you get the true benefits of the technology. Thanks for joining the conversation! This is great food for thought, but I have to disagree. My son had a severe articulation disorder that is now fine but definitely related to his more recent diagnosis of dyslexia. Mainly due to my illnesses he has watched more TV and movies and played more video games than I ever dreamed he would. Rather than hamper his imagination or social skills I believe media has assisted him. So often a show would ignite an idea for creating or acting out with his own toys. When he was struggling to do what his peers were doing, excelling at video games gave him confidence and helped him to relate to other kids by talking about mutual interests. As an only child media helps him connect with other kids and has been an important part of his entertainment. Watching him play video games and talk about them had an added benefit of helping us understand some of the ways his mind works best. He still gets fresh air, plays team sports, is very social. I guess my take on moderation differs a bit too, as I am not big on daily limits. I try to put things in a weekly perspective – for me that is more realistic and I think moderation is learning how to indulge from time to time and then also learning how to abstain – naturally, not based on the clock. Thanks for your thoughtful article. It’s got my brain buzzing. I think you make a great point that there is no one size fits all approach to how we use technology in our homes. Thank you for sharing your story about you son, and I am very happy to hear the posives that he has experienced. My guess is that you are the type of parent who interacts with your child, asks questions, and participates in their life, which makes me think he had a good balance between technology and human interaction. And that is FANTASTIC! However in my work, this is not what I have seen most of the time. In addition, this isn;t just about the kids’ use of technology but the parents’ use as well. If a parent is busy reading her emails at the park, she is missing opportunities to interact with their child. I am trying to be real here: I have been the mom checking her email at the park. BUT I try not to make that the norm. And I don’t judge the parents I see doing it…I give the benefit of the doubt and assume they are like me and won’t check the phone at the next visit to the park. I also agree we need to learn how moderate in a natural way….but for some people it is easier to use a timer or chart for this. It is like people who struggle with weightloss…many people find it easier to moderate food intake by counting calories…it is the same idea. I never meant to imply that everyone needs to use a clock to practice moderation, however. I was simply giving suggestions on what works for my family. Thanks for your feedback! YES!!! Exactly OTMommy…a tool, not a companion…love it! moderation is still such a struggle for me! Excellent post Katie – I recently did a post on my blog entitled “Why TV is good for your child” but essentially I say the same thing. TV can be good if used in moderation With Parental control and mediation. As a therapist, the iPad has revolutionized my life. Tasks that were initially mundane, boring and difficult to engage the child have suddenly become fun and interesting. In saying this, the iPad has NOT replaced traditional board games. The kids still love them and they are so important to teach social- pragmatic skills which cannot be taught using technology. Nikki yes I feel the SAME WAY about TV! It really can be a fantastic educational tool..I personally love watching and learning from TV as do my kids. The key is to continue to learn with all sorts of modalities. 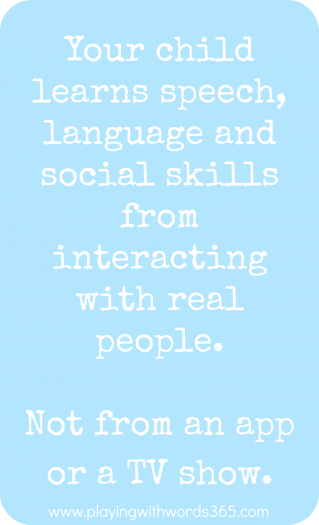 And YES social/pragmatic are hands on that no app can teach! I agree with everything you have said. I see the benefits of technology but also have noticed how it has affected my 12 year-old daughter. She has an ipod touch which she uses to instagram, text through (KIK), facetime, games and music. She is on that ipod touch for hours. My husband and I just attributed it to her somewhat introverted nature. We recently took it away for a pretty long extended time as a punishment and have noticed how much more social she became with us and her siblings. She is even more more pleasant! Also, she thinks it is “weird” when I suggest she just walk across the street to her friends house to ask her to play. If she can not get a hold of her friends on this device then she just sits inside doing nothing. If none of her friends are on this device and she gets desperate she wants me to call the mom on the phone. She does not even know how to talk on the phone to an adult. She also has a phone which she never uses because she does not call her friends. This has been an eye opener for my husband and I and we are making changes. Thanks Leslie for your insight. You know…in mm home we can tell when my daughter has had too much TV. She will start acting more whiney and her behavior will be poor. This is why I started our TV chart and it has made a HUGE difference for us. I think too…that this generation of kids growing up with technology will have very different social skills than what we were raised with. It will be interesting to see in 5 and 10 years how kids are interacting. I was getting all angry when I first read your title because I thought this would be an article about the “evils” of technology and how parents should get rid of everything. I’m SO glad I kept reading!!! My husband and I both have degrees in Educational Technology. I teach numerous online classes. And as the mom of two well-connected teenagers and one speech delayed 2 year old, technology is “at home” in our home. I’ll be the first to admit that the teens spend more time than they should on the phone, texting, facebooking, instagraming, etc. I’ll also admit to setting a place at the dinner table for them to deposit their phones before sitting down to eat 🙂 This brings me to my 2 year old–his speech and language developed nicely until 18 months. We’d noticed before his 2 year appointment that he’d not made much progress in the previous 6 months. We got him into therapy and I started searching the Internet for things I could do to help him. (That’s how I found your wonderful website–Thank you for helping me help him!) Anyway, at 2.5 years I asked his speech therapist how he was progressing compared to others she had worked with–he was still only saying a few words and no two word sentences. She told me that she didn’t feel she should compare since all kids are different. She’s seen many like him that would continue needing help for a long time. She’d seen many others that would have something click all of a sudden. Well, she was right, at least for my little man. And don’t you just know that he was spending a little time playing on my iPhone when that “click” happened. He was on an app where you connect the dots to make letters and then it says the letter name, sound, and words that begin with that letter. He made the letter B, said two of the B words, turned and looked at me and said “‘Dat is B”. That was a month ago and he hasn’t stopped yet. We have a little chatterbox on our hands. I know the iPhone was not totally responsible for his breakthrough, but he was on it when it happened and I will forever credit that technology for it. Thank you for all of the wonderful and appropriate information that you share on your site. Jill THANK YOU so much for sharing your story! And I too am so glad you kept reading 😉 We both agree that technology has a time and a place and that it, without a doubt, has many many advantages. Fr your little guy, that app provided the motivation to share with you what he was interested in and that is AWESOME! I LOVE hearing these little breakthroughs! I am so pleased to hear you are finding my blog helpful as well. Please let me know if there is anything you need! Honestly, I hate to say it, because *you* do balance this story out well, but the initial “research” that was the original basis is the problem. It seems, we as a society always have a problem with the “new” and each and every time something new comes along, there is immediately a study done that shows the “growing problems” that are caused by it. And now it is the turn of the Smartphone, Tablet and other items that are the “new evil” that is a problem. The simple fact is that these items, much like VCRs, DVD Players, MP3 players, laptops, and other items will, after their initial period of excitement, simply blend into just being another tool in our lives. Can they be used too much? Of course. Just as watching too much TV is not good, or eating too much, or drinking too much… “too much” of anything can be bad. It is all about how it is used. But that doesn’t mean you need to rip the iPad out of your kids hand and force them to play Chutes and Ladders… that is only going to create problems that will destroy, not help communication. Thank you so much for your perspective. I am not sure that you understood what I was trying to say in this post. I do not believe that technology is the devil, but I do think we, as a society, need to be more responsible with it. No where did I say you need to take it all away from your children and play chutes and ladders…my point is BALANCE. Great post! Totally agree with everything you have said. With my girls, aged 7 & 9, they are allowed to play with the iPad for 20 minutes a day. We set a timer and they get off when the beeper goes off. No TV during the week. The key, I have found, is that we have to set a good example as parents. I don’t watch TV during the day, during the week. I try and get off the devices when the kids are around. It is a challenge, no doubt. But it’s just one more challenge in the difficult role of being a parent…no one said it was going to be easy! We are having a speech therapist come once a week and my son does seem to be progressing somewhat, although he is still behind his peers. Anyway, thanks for the post and I plan to use your TV Chart–for the whole family. Welcome Emily! 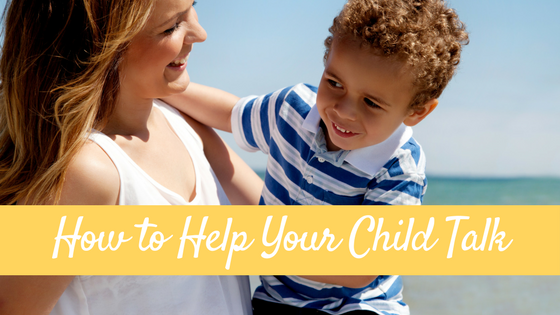 As a parent, I think we beat ourselves up enough 😉 You certainly don’t need some blogger to make you do it more, so I am glad this article didn’t make you feel that way! You definitely saw my point, that it is about balance and that technology absolutely has a time, and place, and can be very effective teaching tools. I admit in my article that we have ALL those gadgets and that I am the first to admit sometimes they get too much screen time. It happens. We are human and some days you just NEED A BREAK and throwing on a 20 minute program can save our sanity! Good luck to you and your family! Excellent post Katie! You are so articulate about many of the things I’ve noticed too, in myself and other parents. I did a survey with another blogger a few months ago of 100 high tech households to see what strategies were most popular to limit ‘screen time’ and we had a lot of interesting comments. If you’d like to see the raw data or more comments, just let me know. Very very cool Carisa! I will have to go check it out! 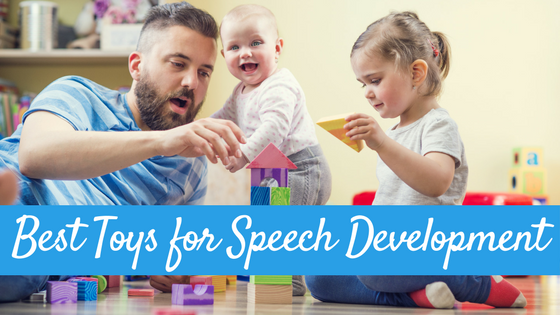 I don’t necessarily think that it’s messing with their speech and language skills if you are letting them play at the right age. Once they already have a good foundation. I actually think it would benefit them to play games in moderation of course. I know that I became much better at reading when I started playing games it helped me to read and process information at a faster rate. Parents need to unhook too. What apps would you recommend as helpful for the times that we do let our kids use the iPad? We try to play the games with them so that they can learn new vocab etc. Hi Michelle! I’ll be honest, I am the LAST person to ask about apps. I don’t use apps in therapy or much with my own kids even! The absolutely BEST thing you can do for a child’s vocabulary is to READ and TALK…a lot 😉 That said, limited iPad time is totally fine and I would just find some apps they find enjoyable…how old are your children? I love your blog! I am currently writing about the influence of computers/electronic devices on early childhood communication and language development. Everything you say rings true! Would you be willing to write a small piece/case study about this for my book? I feel it would really help to bring the issues alive for the reader, in a non-judgmental way. The best way to promote speech, language and communication to children according to my experience is get their grandparents and let them stay with the children and then see the magic happen! The result is indeed amazingly beautiful! Grandparents have all the time in the world for their grandchildren and are ready and patient to listen to them, talk to them, read to them and pretend play with them without judging them and giving them unconditional love.